When Coach Jim Miller speaks about his story, people love to hear about the “Sustained Success” Month after Month, Year after Year, and even Decade after Decade.. Coach came into an underperforming program that had not won a Conference Championship in 15 years to Winning 21 in a row, and then placing 1st or 2nd in the NATION 18 of his 22 years. That run included 10 NCAA CHAMPIONSHIPS! 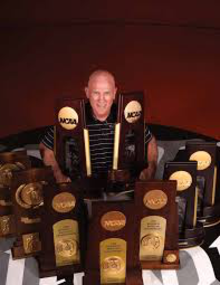 Just as he took the Wartburg College Program from mediocre to the Best NCAA D-3 Team in History, he will share with you his secrets of how to win the battles ahead, to Think at a Higher level, and the Benefits of “Going the Extra Mile” for yourself and your Team. When things get tough you ‘Do it Anyway’, even when you might not want to, or you don’t feel like it. Or as Coach Miller says, ‘whether you feel like it or not is really Irrelevant, you Do it Anyway’.